It’s been a while since I made a new fabric design, and I’ve wanted to make some more bee themed fabrics for the next batch of wax wraps I’m making. If you don’t know what those are, I’m working on a video for on over on my lifestyle blog SimplyKlaire.com which will hopefully be up in the next few weeks, and I can show you then. 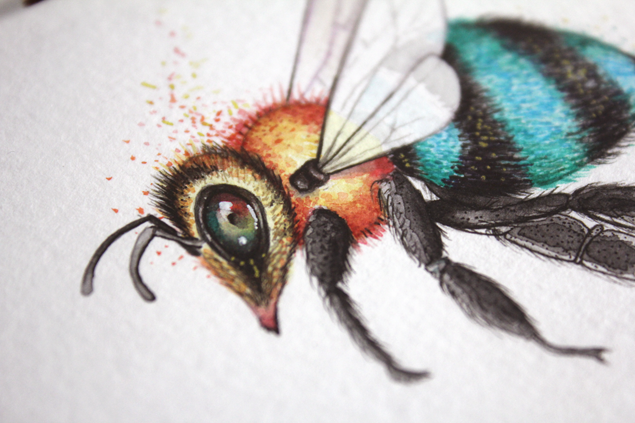 At the moment I’m having a bit of a bee and insect obsession. Especially after I did my cockroach design I noticed just how beautiful some of the colours are on creatures we normally don’t look twice at (or run screaming from). Some moths, for example, have some of the most amazing colours on their wings, when normally we think of them as the dull cousins of butterflies, so I think I’ll do one of those next. Or maybe a scarab…I’m not sure yet. Maybe both? I’ll be giving away one of these on Patreon and the other two are up for sale on eBay already, but if you wanted to see how the design went from start to finish I’ve show what I used and how the first fabric swatch turned out. In the end, the first swatch came out a little too dark, but the second swatch which arrived a few days ago was absolutely perfect! It didn’t arrive in time for me to include it in the video, but I’ll be able to show it to you over on SimplyKlaire.com once my beeswax wrap DIY goes up.